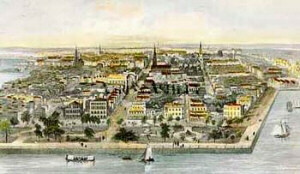 Charleston, 1670-1790. Columbia, since 1790. May 23, 1788, 8th State. South Carolina Geography, 32,007 square miles. South Carolina meets the Atlantic Ocean on its eastern border. 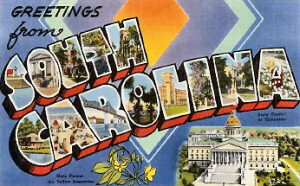 Constitution: South Carolina Constitution, 8th state to enter the Union. Manufacturing: In manufacturing, chemicals are most important in the state and South Carolina produces synthetic fibers, plastic resins, dyes and pharmaceuticals. Textile production (acrylic, cotton, polyester, silk, wool fabrics - plastic and glass fiber yarns - rayon and nylon tire cord - clothing and other finished textile products)is the second-ranking manufacturing activity. Forest products such as wood, pulp and paper products (paper, paperboard) rank third. Services: Wholesale and retail trade rank first among South Carolina's service industries, benefiting from the state's year-round tourism industry. 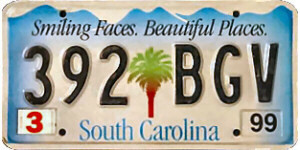 Wholesale trade in South Carolina revolves around automobiles, groceries and textiles. Retail trade benefits from sales made in food stores, discount stores and restaurants. Ranking second in the state is the community, business and personal services sector, again benefiting from the state's tourism industry. A variety of services contribute to this group. Important are private health care, engineering firms, hotels and repair shops. Government services (public schools and hospitals, several military bases)rank third in South Carolina. Mining: Granite and limestone are two of South Carolina's most valuable mined products. Gold is also mined in the state. South Carolina is a leading state in the production of kaolin, mica, and vermiculite. Fishing: The most important catch for South Carolina is shrimp. The state also brings in clams, crabs, oysters and snapper. Highest Point: Sassafras Mountain, 3,560 feet above sea level. 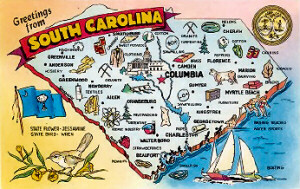 Natural Resources: Natural resources of South Carolina include rich soils, minerals (kaolin clay, limestone, peat and sand and gravel, gold, granite, mica, sand, talc, topaz, vermiculite), vast forests (loblolly, pines, oaks, hickories, dogwoods, red maples, slash and longleaf pines, oaks, hickories, magnolias, bay trees, baldcypresses, black tupelos, sweet gums, tulip trees, hemlocks, palmettos), and a plentiful water supply. South Carolina House: South Carolina State Representatives.